WARNING: Rarely, didanosine has caused a severe (sometimes fatal) pancreas problem (pancreatitis) when used alone or with other HIV medicines. Immediately tell your doctor if you develop symptoms of pancreatitis (persistent nausea/vomiting, stomach/abdominal/back pain). Rarely, didanosine has caused a severe (sometimes fatal) liver and blood problem (lactic acidosis). Immediately tell your doctor if you develop symptoms of liver problems (persistent nausea, stomach/abdominal pain, dark urine, yellowing eyes/skin) or lactic acidosis (rapid breathing, drowsiness, muscle aches, severe weakness). Pregnant women with HIV may be more likely to have this problem. Liver and pancreas problems may be more likely if didanosine is used in combination with hydroxyurea and/or another HIV medicine (stavudine). USES: This drug is used with other HIV medications to help control HIV infection. It helps to decrease the amount of HIV in your body so your immune system can work better. This lowers your chance of getting HIV complications (such as new infections, cancer) and improves your quality of life. 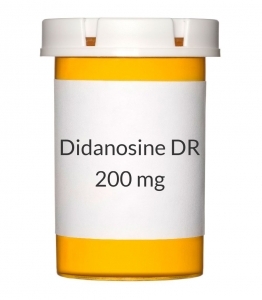 Didanosine belongs to a class of drugs known as nucleoside reverse transcriptase inhibitors-NRTI. Didanosine is not a cure for HIV infection. To decrease your risk of spreading HIV disease to others, do all of the following: (1) continue to take all HIV medications exactly as prescribed by your doctor, (2) always use an effective barrier method (latex or polyurethane condoms/dental dams) during all sexual activity, and (3) do not share personal items (such as needles/syringes, toothbrushes, and razors) that may have contacted blood or other body fluids. Consult your doctor or pharmacist for more details. OTHER USES: This section contains uses of this drug that are not listed in the approved professional labeling for the drug but that may be prescribed by your health care professional. Use this drug for a condition that is listed in this section only if it has been so prescribed by your health care professional. This product may also be used in combination with other HIV medications to reduce the risk of getting HIV infection after contact with the virus. Consult your doctor for more details. HOW TO USE: Read the Medication Guide provided by your pharmacist before you start using didanosine and each time you get a refill. If you have any questions, ask your doctor or pharmacist. Take this medication by mouth usually once daily on an empty stomach, at least 1 and 1/2 hours before or 2 hours after a meal, or as directed by your doctor. Swallow the capsules whole. Do not crush, chew, or open the capsules. Doing so may decrease their effectiveness. The dosage is based on your weight, medical condition, and response to treatment. It is very important to continue taking this medication (and other HIV medications) exactly as prescribed by your doctor. Do not skip any doses. Do not increase your dose, take this drug more often than prescribed, or stop taking it (or other HIV medicines) even for a short time unless directed to do so by your doctor. Skipping or changing your dose without approval from your doctor may cause the amount of virus to increase, make the infection more difficult to treat (resistant), or worsen side effects. This medication works best when the amount of drug in your body is kept at a constant level. Therefore, take this drug at evenly spaced intervals. To help you remember, take it at the same time(s) each day. SIDE EFFECTS: See also Warning section. Headache or diarrhea may occur. If any of these effects persist or worsen, notify your doctor or pharmacist promptly. Remember that your doctor has prescribed this medication because he or she has judged that the benefit to you is greater than the risk of side effects. Many people using this medication do not have serious side effects. Some people may experience worsening of a previous medical condition (such as an old infection) as their immune systems improve, or develop new conditions because their immune systems have become overactive. This reaction may occur at any time (soon after starting HIV treatment or many months later). Tell your doctor right away if you have any serious side effects, including: unexplained weight loss, persistent muscle aches/weakness, joint pain, numbness/tingling of the hands/feet/arms/legs, severe tiredness, vision changes, severe/persistent headaches, signs of infection (such as fever, chills, trouble breathing, cough, non-healing skin sores), signs of an overactive thyroid (such as irritability, nervousness, heat intolerance, fast/pounding/irregular heartbeat, bulging eyes, unusual growth in the neck/thyroid known as a goiter), signs of a certain nerve problem known as Guillain-Barre Syndrome (such as difficulty breathing/swallowing/moving your eyes, drooping face, paralysis, slurred speech). This medication can cause severe nerve problems in the hands/feet/legs (peripheral neuropathy). Symptoms may include numbness/tingling/pain in the palms of the hand or soles of the feet. If you experience any of these symptoms, contact your doctor immediately so that you can be monitored closely. Your doctor may decide to reduce or stop your dose of didanosine. Tell your doctor immediately if any of these rare but very serious side effects occur: vision problems (such as blurred vision, difficulty seeing colors), vomiting up blood, belly/abdominal swelling, easy bruising or bleeding. Changes in body fat may occur while you are taking HIV medication (such as increased fat in the upper back and stomach areas, decreased fat in the arms and legs). The cause and long-term effects of these changes are unknown. Discuss the risks and benefits of therapy with your doctor, as well as the possible role of exercise to reduce this side effect. A very serious allergic reaction to this drug is rare. However, seek immediate medical attention if you notice any symptoms of a serious allergic reaction, including: rash, itching/swelling (especially of the face/tongue/throat), severe dizziness, trouble breathing. This is not a complete list of possible side effects. If you notice other effects not listed above, contact your doctor or pharmacist. In the U.S. - Call your doctor for medical advice about side effects. You may report side effects to FDA at 1-800-FDA-1088. In Canada - Call your doctor for medical advice about side effects. You may report side effects to Health Canada at 1-866-234-2345. PRECAUTIONS: Before taking didanosine, tell your doctor or pharmacist if you are allergic to it; or if you have any other allergies. This product may contain inactive ingredients, which can cause allergic reactions or other problems. Talk to your pharmacist for more details. Before using this medication, tell your doctor or pharmacist your medical history, especially of: pancreatitis, kidney problems, liver problems (such as hepatitis, cirrhosis), nerve problems (such as peripheral neuropathy), alcohol use, high fat levels in the blood (triglycerides), gall bladder problems (such as gall stones), gout. Avoid alcoholic beverages because they may increase your risk for liver problems and pancreatitis. Didanosine may increase your risk of a heart attack. Discuss the risks and benefits of treatment with your doctor and ways to lower your risk of heart disease. Tell your doctor if you have heart problems, if you smoke, or if you have other conditions that increase your risk of heart disease such as high blood pressure, diabetes, or high cholesterol levels. Before having surgery, tell your doctor or dentist about all the products you use (including prescription drugs, nonprescription drugs, and herbal products). Kidney function declines as you grow older. This medication is removed by the kidneys. Therefore, caution is advised when using this drug in older adults because they may be more sensitive to the effects of the drug, especially the increased risk of pancreatitis. During pregnancy, this medication should be used only when clearly needed. However, it is now normal to prescribe HIV medicines for pregnant women with HIV. This has been shown to decrease the risk of giving HIV to the baby. Didanosine may be part of that treatment. Discuss the risks and benefits with your doctor. It is not known if this medication passes into breast milk. Because breast milk can transmit HIV, do not breast-feed. DRUG INTERACTIONS: See also Warning section. The effects of some drugs can change if you take other drugs or herbal products at the same time. This can increase your risk for serious side effects or may cause your medications not to work correctly. These drug interactions are possible, but do not always occur. Your doctor or pharmacist can often prevent or manage interactions by changing how you use your medications or by close monitoring. To help your doctor and pharmacist give you the best care, be sure to tell your doctor and pharmacist about all the products you use (including prescription drugs, nonprescription drugs, and herbal products) before starting treatment with this product. While using this product, do not start, stop, or change the dosage of any other medicines you are using without your doctor's approval. Some products that may interact with this drug include: ribavirin, methadone, allopurinol, drugs that are known to cause nerve problems (such as isoniazid, vincristine), drugs known to cause pancreatitis (such as pentamidine, ganciclovir, co-trimoxazole), stavudine, tenofovir. This document does not contain all possible interactions. Therefore, before using this product, tell your doctor or pharmacist of all the products you use. Keep a list of all your medications with you, and share the list with your doctor and pharmacist. OVERDOSE: If overdose is suspected, contact a poison control center or emergency room immediately. U.S. residents can call the U.S. national poison hotline at 1-800-222-1222. Canadian residents should call their local poison control center directly. NOTES: Do not share this medication with others. Laboratory and/or medical tests (such as eye exams, kidney tests, liver tests, complete blood count with platelets, viral load, T-cell counts) should be performed periodically to monitor your progress or check for side effects. Consult your doctor for more details. Keep all medical and laboratory appointments.